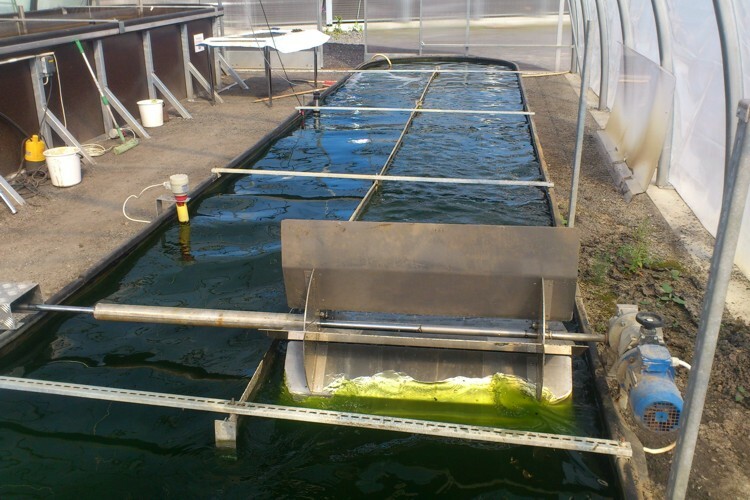 In this we study the basic properties of algae and cyanobacteria isolated from northern environments and investigate their optimal growth on municipal and industrial waste water and combustion gases. The microorganisms therefore will clean our water and produce biomass at the same time. We then study the use of the microbial biomass and its potential for the production of sustainable energy production or valuable products. The work integrates purification processes, cultivation of photosynthetic microorganisms and the production of sustainable energy production or valuable products. 7500 L pond pilot in Dåva. The project differs from other research initiatives due to its focus on microorganisms adapted to northern latitudes, which demands acclimation to significant annual variations in the availability of sunlight and growth even at relatively low temperatures. Furthermore, nitrogen-fixing cyanobacteria and mixed (photoautotrophic/ heterotrophic) cultures will be studied. These microbial communities will grow in sewage and use carbon dioxide supplied from flue gases. We place emphasis on the projects integration with other processes, the production of sustainable energy carriers and value-added products. We also study the accumulation of toxic and anthropogenic substances in the algal biomass. Energy balances of algal culture conditions in different scales and different designs of the production process will be explored. Photosynthetic capacity of local micro-organisms Collection of natural algal and cyanobacterial strains that grow in rivers, lakes, the Baltic Sea in (Northern) Sweden. We then are growing these algae and photosynthetic bacteria on waste water and flue gas from Industry; we are interested in biomass production and at the same time want to clean the waste water from organic compounds (recycle nitrogen and phosphorus). We therefore focus on strains and algal/cyanobacterial communities that grow best in different kinds of municipal and industrial waste water. As we have in Sweden with very little light in autumn and winter, we also are looking for heterotrophic bacteria and fungi, that can grow together with our algae. The aim is to prolong the growth phase of our microbial communities over the dark period as long as possible. This work package is performed in the lab. Up-scaling of cultures Up-scale to larger cultures (so far we upscale to 7500 L (see Picture), but our aim is to up-scale to 40000 L in the pilot in Dåva). The large cultures are maintained in a pond outside, therefore here we can analyse the “real” outdoor conditions and test the stability of our microbial communities. Characterization and utilization of microbial biomass The algal biomass then is harvested regularly and we are analyzing the compounds. Algae grown on waste water from Norrmejeriet have very much lipids and therefore are very good for bioethanol production, but algae grown on waste water from pulp and paper are very low in lipids. Still some of these algae generate compounds of higher value (e.g. carotenoids). In this step we also have to see if toxins accumulate in the algae, which would prevent them from being used as fish feed. Alternatively some cyanobacteria generate toxins themselves. Energy balances and process integration Modeling and energetic calculations of the process.